Yes, it was so good to be there! Just what I needed! And Thomas can enjoy his shirt veeeeery long! The newest thing here is that Thomas want to visit Jay's homeland. but he wants to learn the language he says . We will see. I always wanted to go to the UK, but my ex didn't want to go... (tsss, one more reason we split up haha) could be fun for the summer holidays! Thomas is still playing Jamiroquai with his friends haha. Thomas went to the hairdresser! And he needed to go... there were living birds in his hair! I hardly recognise him haha! He is very cool ha?! Last edited by MrsMadHattersHat on Fri Sep 09, 2011 8:18 am, edited 1 time in total. Mrs. Hat, your little man is adorable!!! Seems to be full of personality! Hahahaha, we were playing with the computer and some photo's! What do you say Jay?! Jay: Soooo Thomas...what happened to your hair? Last edited by MrsMadHattersHat on Tue Jul 26, 2011 8:41 am, edited 2 times in total. Yeah just wait til you have some you'll see. I already know Thomas will not be the easy-going teen, he realy is the kind who is always testing the borders (limits)... and with Jay as his hero... o-ooh! But we will survive . And a picture of Sarah the little gardener. Last edited by MrsMadHattersHat on Tue Jul 26, 2011 8:40 am, edited 1 time in total. Beautiful kids and beautiful times. Parenthood -What I miss most is my sleep! Thomas became 7 this Wednesday! he is already making songs... in English "I like it! Peek-a-boo! I like it! Peek-a-boo! ", this is a song for his new rabbit! Last edited by MrsMadHattersHat on Fri Jun 01, 2012 7:37 am, edited 1 time in total. 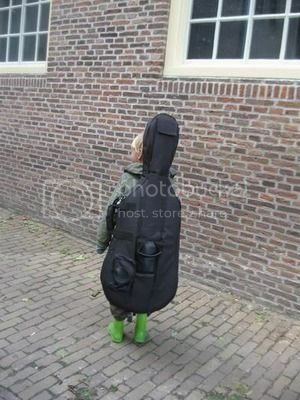 a walking cello with green boots!!! We started a new adventure here! Mr. Cello as Thomas calls his instrument is his new best friend. He even sleeps with his cello beside him ! 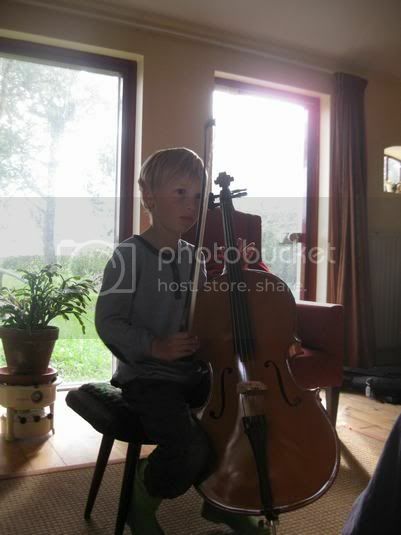 "Mister Cello and I are going to play with Jay ones!" So beautiful to see how music won his heart! That's great that he's starting so young. It's so big compared to him! The kids here don't usually start string instruments til 4th grade, band in 5th. But I had my milleniumbabe in piano for 2 years. Jay is learning Th some English words . He's watching a lot Jay/Jamiroquai clips and interviews on youtube and the newest hottest word he learned is cucumber! @ MrsMadHattersHat - that is so cool! Oh so funny to read this back! Th is almost 10 now, and still a hugh Jamiroquai fan. We were dancing in the supermarket last saturday, because we heard Jamiroquai on the radio, and we had a great time between the olive oil and pasta sauce! We decided that from now on Saturday is Dancing-in-the-Supermarket-day, were we all can show our special disco skills and feel no blame or shame, because it's making you and everybody who is looking smile/laugh/think you are nuts! We hope it's going to be an official day once! Th bought himself a drum kit (he saved his money for about 4 years), Mister Cello was not a very long lasting friendship (2 years). He is into Buddhism now, and for that reason he cut off his long hair. And he is very much into animal protection (that's the main reason he started to get interested into Buddhism), the protection goes from spiders in our home/garden/the spider smacking neighbours to the Hawksbill Sea Turtle and the polar bear. Well this is Th in a nut shell! Aw Thomas is almost 10? Amazing! wow, Thomas is already into all that?! Musid, Religion and Environmental Protection?! and I'M THE ONE mature for my age?